Please join us Wednesday 09.25.13 for another edition of Writing on the Air. We broadcast every Wednesday from 6-7 pm. You can catch us on your local Austin 91.7 FM KOOP radio station, or you can stream us LIVE on KOOP.org. And please LIKE Writing on the Air on Facebook because … why not? Aren’t you on Facebook anyway? This week our guests are Ryan Sharp – Editor of Borderlands: Texas Poetry Review, and the founding editors: D’Arcy Randall and Dorothy Barnett, as well as poet Katherine Oldmixon. They are launching their 21st Anniversary issue this fall (issue 39). The issue will include an interview of the founding editors, D’Arcy Arnold and Dorothy Barnett, that was conducted by Katherine Oldmixon, who has edited Borderlands in the past. The issue will also mark a layout shift that includes a featured poet section that will include an interview, a review, and a selection of poems from the featured poet. 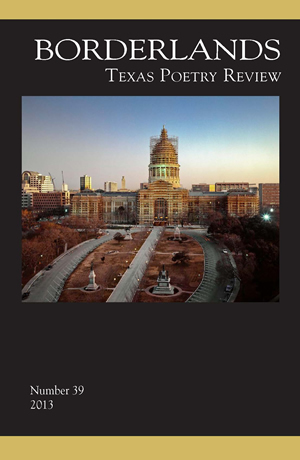 In this issue Austin poet Nick Courtright is the featured poet. We will be talking about the the new directions the journal is taking (including a new Facebook page, a transition toward the use of an electronic submission manager, more utilization of our web presence, etc.). The big launch of Borderlands Issue #39 is September 29th.